We have been converting turf back into native plantings in our yard. 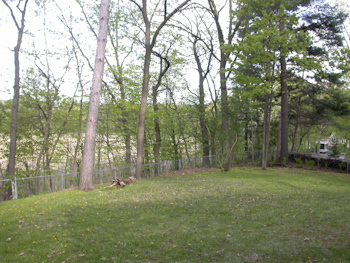 The backyard was all lawn and trees when we moved into our house in 2004. 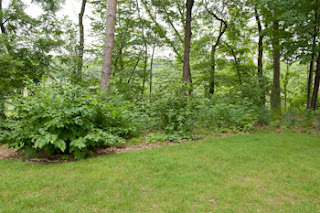 Since then, we smothered the grass with paper and wood mulch (see this related posting), then we started to add back native tree, shrub and perennial species. After the lawn was smothered, we no longer needed wood mulch (just the one application). We then allowed the leaf litter each fall to start building up on the decaying mulch. This created a very nice layer of organic matter and humus, a perfect place for tree seedlings to germinate. This was the first season that we started to get tree seedlings emerging in this part of the yard. 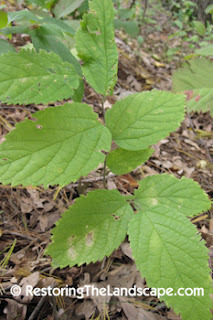 I was thrilled to find several Ironwood (Ostrya virginiana), Basswood (Tilia americana), Oak (Red and Pin), Hackberry (Celtis occidentalis) and Black Cherry (Prunus serotina). All of these tree species are in our yard or just over the fence. 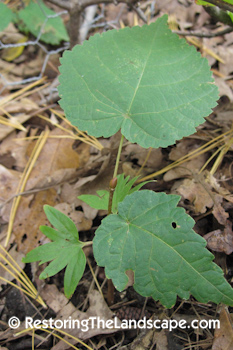 Their seeds would most likely have been distributed by squirrels, birds and other wildlife. 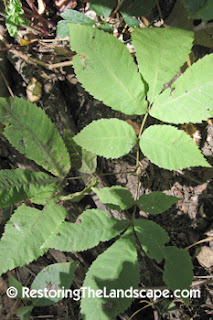 The most amazing discovery of all although was a Bitternut Hickory seedling (Carya cordiformis). 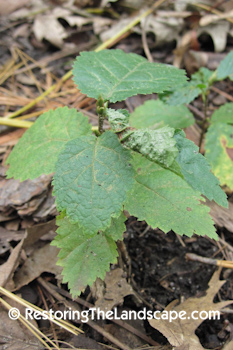 I found this seedling while putting some chicken wire around some new Hazelnut shrubs (so the rabbits won't browse on them this winter). 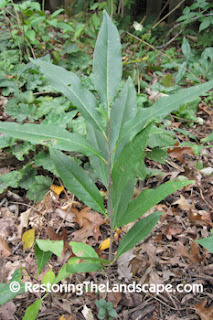 There are a few Bitternut Hickory in our neighborhood, but the closest trees are at least a couple thousand feet away from our yard. Bitternut Hickory have tell tale yellow colored buds that make these seedlings easy to identify in the winter months. 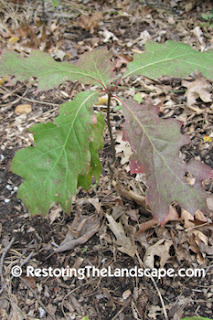 We have planted one Bitternut Hickory in the lower part of our yard, but this seedling was a welcome sight.